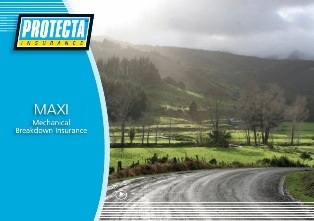 PROTECTA Insurance Mechanical Breakdown Insurance provides you with peace of mind. to the Terms and Conditions and Limits of Liability stated in the Policy. Note: This is NOT a policy wording, but a summary of cover. If you wish to proceed with your Protecta Mechanical warranty please fill out form we can call you back to make payment by credit card or bank transfer. If you wish to ask a question please also fill in form .